Since I was around 11 years old, I’ve liked to cook, bake, eat, read cookbooks, and just about anything that has something to do with the creation of food. Nine times out of 10, I’ll try to make it. Not just try…. but thanks to the wonder of the Google search engine, try and try and try until I feel like it’s as close as something can possibly be without factory machinery or untold amounts of some chemical compound that can only be bought in massive quantities. For instance, it’s a drive (well, where I live everything is a drive) to find Annie Sloan chalk paint. I just can’t see driving an hour to buy a quart of paint for $26. You might have seen the antique gossip bench that my kids bought me for Christmas a few years ago that had been languishing in a corner of the garage. Even though we’re still waiting to sell our house, I’m ready to move on with a different color decorating scheme, so I chose to redo the bench in the grays, blues, and whites that I will eventually have whenever we move. 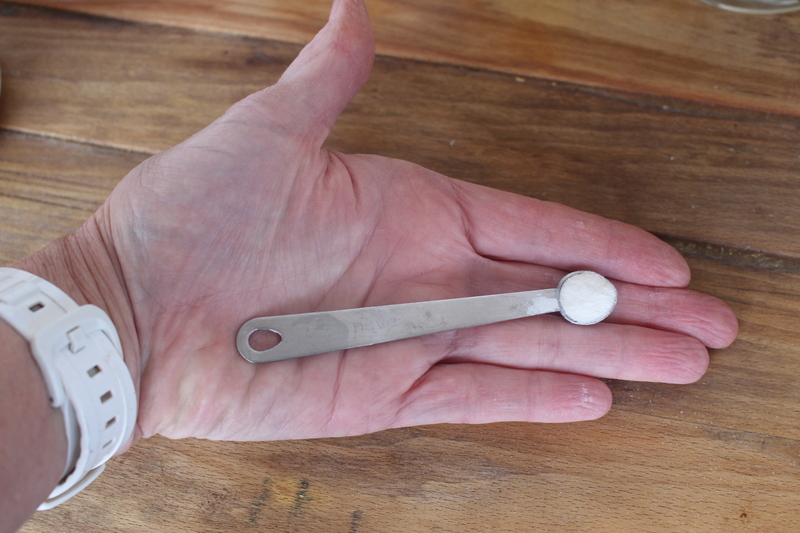 So I Googled “homemade chalk paint for furniture” and voilà, found out how to do it myself. And I love how it turned out, at a fraction of the cost, and I only had to drive into my garage to find the materials! Similarly, my mostest favorite, FAVORITE vegetable is butternut squash, so when I saw a butternut pasta sauce at World Market one day, I had to buy it. And then I practically ate the whole jar by itself, with pasta as the side dish… But again, the expense and the drive convinced me to tinker until I found a way to make it myself (hopefully, a post on that is coming soon…). Same with making my own version of Panera’s Vegetarian Autumn Squash soup, which got me through many a cold day last winter. Living an hour away, it’s not like I can just hop in my car to pick up a bowl whenever I feel like it. Ditto with Starbucks drinks.. Whenever I get a hankering for a white chocolate raspberry mocha or salted caramel mocha frappucino, it’s more than just the $5 cost of the drink, it’s also a one hour drive and the cost of the gas to get there. It ends up being about a $9 drink instead. So unless I’m out of town and I come across one on my travels, I rarely get them. But get them, I do. If it’s cold, I do like hot coffee, but lately, despite the chillier weather, I’ll often get a frappucino, or as I read recently in this great article about the next wave of retail coffee, the #1 selling milkshake in America. 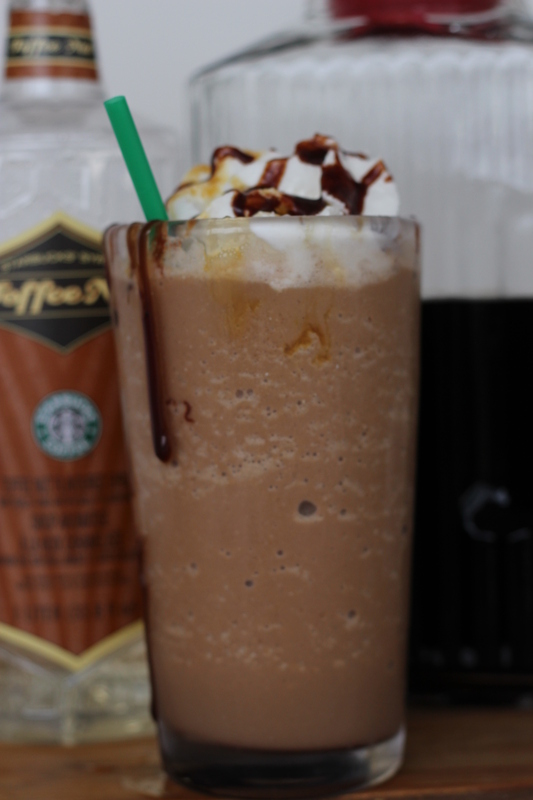 Because I like to tinker, I’ve tried to replicate frappucinos myself at home so I can have them more frequently. And cheaply. Especially because you can buy most Starbucks syrups in their stores or at Target locations. Plus, I can also control the calories in them. There are LOTS of frappucino recipes out there, to be sure. Most nail the taste, but not the consistency. For me, it’s not only about the taste. I like the smoothness of the real stuff, and I had difficulty replicating it in my own kitchen. It just doesn’t work for me if I get all the taste, but after 10 or so sips, what’s left is a glop of crushed ice because I’ve drunk all the liquid already. I searched online for something that would hold it together. For a time, I used 1 teaspoon of fruit pectin. It sort of worked, but not great. Besides, once a package of pectin is opened and exposed to air, after a time it’ll take on a bitter taste. Who wants that? It wasn’t until I was on a totally separate witch-hunt looking up some information about the role of xanthum gum* in gluten free baking, that I thought to try it. Xanthum gum is used to add volume in gluten free baking, but if you also read labels on many of the things you find in the grocery, you’ll discover it’s used as a thickening agent in ice creams, smoothies, salad dressings and all sorts of things. It works, people. And a little goes a loooooong way. Now with my faux frappucinos there’s still coffee in the very last sip, and the ice doesn’t separate from the liquids at all. It’s a smooth, creamy beverage, just like at the stores. *Xanthum gum can be made from some ingredients that might cause allergies, such as corn or soy. If you have food allergies, it’s better to check before using it! Place crushed ice in a blender. Pour coffee to a little over the top of the ice. 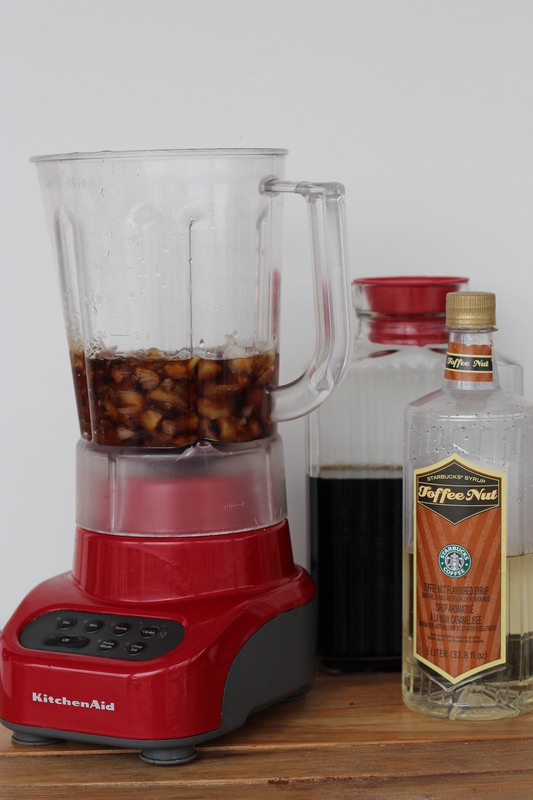 Add in your remaining ingredients and blend on high until it’s thoroughly mixed. Pour into a large cup and sip away! 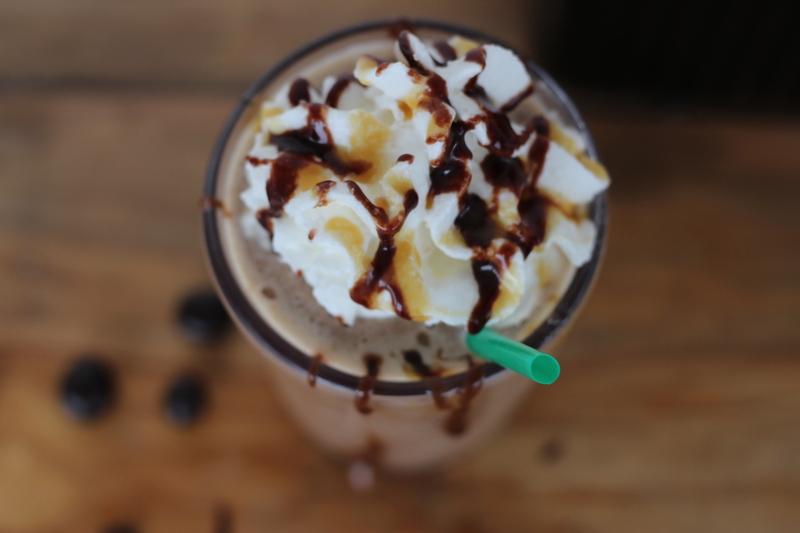 If you just want the mocha mocha, the chocolate syrup might not be enough to make it sweet enough for you. 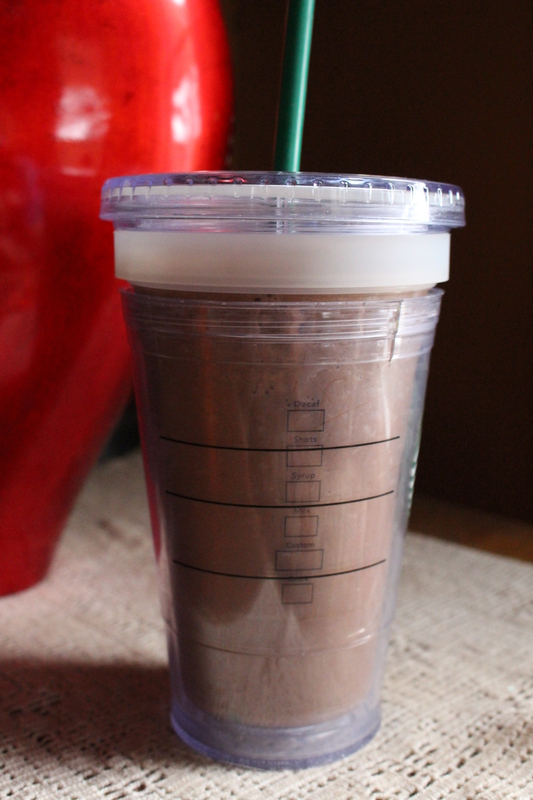 I use a shake or couple drops of stevia to sweeten it without adding extra calories. The powdered milk helps cuts some calories, but if you want, make it all cream or ½ and ½. 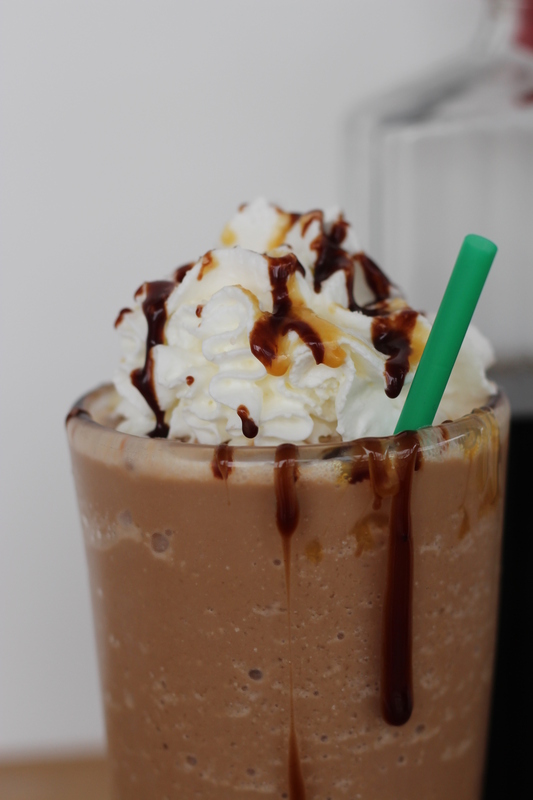 To make flavored frappucinos, add 2 – 4 T of the syrups along with the chocolate syrup. Peppermint flavor obviously is a lot stronger than a vanilla, so add it a little at a time. God may not laugh at our plans, but He sure must be amused! Thanks for the xanthan gum. I am having one of these every day on the boat. They are delicious! !